Dr Puneet Tyagi did MBBS from Maulana Azad Medical College, Delhi. He is trained in pulmonary medicine & Critical Care from a prestigious institute of India (VP Chest Institute Delhi. 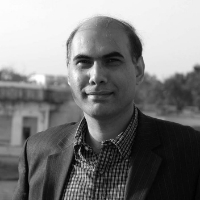 Previously he was Principal Consultant at Max Superspeciality Hospital, Dehradun. He was also appointed as the MD at Valabh Bhai Chest Institute, Delhi. Post that, he has worked with various hospitals such as SRMS Medical College, Bareilly, CMI Hospital and MAX Hospital, Dehradun. He has 22 years of experience in pulmonary medicine & Critical Care. He is the head of Pulmonary & Critical Care Medicine at Velmed Hospitals, Dehradun. "After completing my education, I have worked with various hospitals in Delhi, Bareilly and Dehradun. I am working at Velmed Hospitals, Dehradun as the head of Pulmonary & Critical Care Medicine. I am trained in pulmonary medicine & Critical Care from a prestigious institute of India (VP Chest Institute Delhi. Previously I was Principal Consultant at Max Superspeciality Hospital, Dehradun, and I have 22 years of experience in pulmonary medicine & Critical Care."